China at the moment is one of the best funds to invest in based on expected returns using our valuation method (see previous postings on adjustment rate and core funds valuations for more info). Estimated returns look close to 8% pa at present due to high growth rates for China and low PE ratios on the market at present. The credit crisis of 2008 resulted in some increased volatility. Following that the fund increased in value by 130% from its low in 2008 to its peak in 2010. Since then the price has been up and down without any clear trend. At present the fund is 38% below its peak in late 2007. As you can see the fund is pretty heavy on financial stocks making over 50% of the index. The banks are all on modest PE ratios of 5-6 and pay generous dividends. The banks are all more than 40% below their high prices so some downside risk has already been removed. The insurance companies look a bit more pricey but those too have seen significant falls. The high concentration of the index on financial stocks makes me a bit wary. 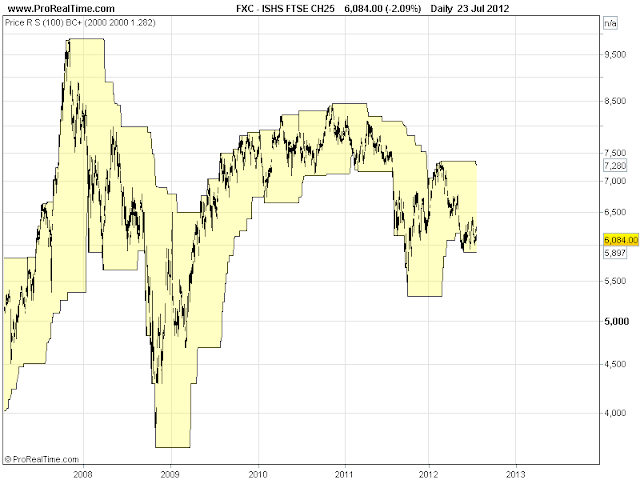 The banks look reasonably priced and are discounted from their highs so their is some upside potential. If you can stomach having over 50% of your assets in financial stocks then the returns do look attractive. I think the lack of diversity in the fund and the sheer complexity of valuing financial stocks means this fund probably shouldn't make up a significant part of your overall portfolio, certainly less than 25%. 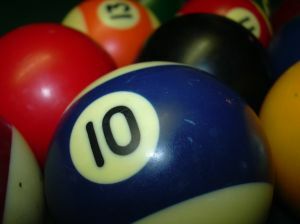 The "6 of the Best" portfolio that began in June is still going strong. It is now up over 10% (as a crude benchmark the FTSE 100 index is up less than 2% over the same period). If you remember the 6 of the best portfolio invests in 6 different funds. One core fund which is a large international or regional equity fund, an additional equity fund which can be any size or country or region, a bond fund (corporate or government bonds), a FTSE100 stock, a REIT fund and a commodity fund. 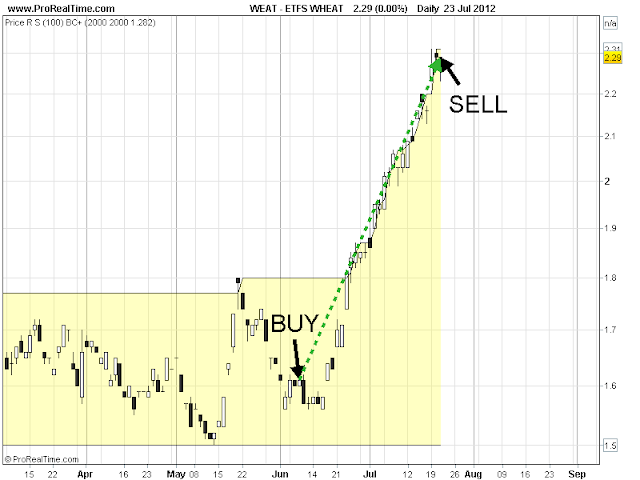 The majority of the gains have come from a very successful trade in Wheat (WEAT.L) which is up 43% since mid June. It's now time to sell wheat as we have a potentially better trade available in natural gas which has broken it's 100 day high for the first time in 4 years and looks a very promising investment with estimated returns of over 15% a year from our valuation model. 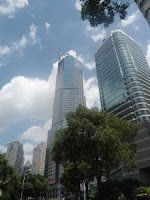 The Asian Property Fund (IASP.L) goes ex div tomorrow and will pay approximately a GBP24 dividend for our holdings. No other income on the fund is due at present. Admittedly it's been less than 2 weeks since the last update but I thought I would add it to this post out of consistency. The performance hasn't been great with an overall fall of 0.79%. It compares well to the FTSE which has fallen 2.12% over the same period. Overall since inception on the 28th of May the top ten in our list is up 6.81% compared to 3.51% up for the FTSE100. Europe: Time to be Greedy?